High-rise commercial buildings with beautiful, large windows look very attractive but not many people have an idea as to how the glass façade and windows of these buildings are actually cleaned. The conventional methods, process and tools of cleaning windows in ordinary buildings cannot be applied to high rise windows because they are usually extremely inaccessible and there are many other risk factors that come into play. Cleaning the windows from outside requires a completely specialized approach and unique tools. Only highly skilled commercial window cleaning professionals who have been extensively trained for the job can handle it. Window cleaning on high rise buildings can be hazardous and even life-threatening which is why it must always be handled by highly-trained and experienced professionals. High-rise commercial window cleaning services use advanced custom-designed equipment for the cleaning application. Those directly involved in the cleaning task as well as the support staff at the top and ground level must coordinate seamlessly with each other to work with clockwork precision so that even the slightest of errors are avoided. High rise commercial window cleaning services are generally called upon for servicing and cleaning tall buildings such as office skyscrapers, hotels, shopping malls, offices, airports, railways stations, and other similar structures which cannot be cleaned and maintained by ordinary methods and tools. 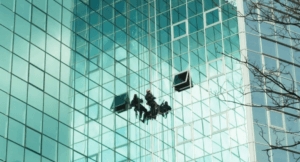 High rise commercial glass cleaning professionals are trained to remove accumulated dirt from the main areas as well as hidden and inaccessible corners. They also know how to tackle tough and stubborn marks using specialized tools and accessories. The cleaning process can involve the use of special detergents and products that do not leave unappealing streaks on the windows. They can cover large areas of glass facades and windows in high rise buildings within a short time and with a great degree of expertise. High rise commercial glass cleaning in any state requires adherence to stringent standards of safety set by the relevant authorities. It is imperative that only the services of licensed and insured service providers be used. The employees involved in the task must go through mandatory safety training because of the extremely risky nature of the job. Stage scaffolding was commonly used in the past but they are very hazardous. There were many instances where the scaffolding got smashed against the exteriors due to the force of wind which can be quite strong at certain heights. Window cleaning professionals now employ advanced cleaning platforms such as BMU’s, Cherry pickers, or rope access techniques. They can be used to clean Perth high rise commercial building exteriors with a significant level of safety. What They Do- They are professional window cleaners that specialize in cleaning high rise windows. The high rise buildings may be residential properties or commercial properties, and they have the right tools needed to clean high rise windows properly. In short, they are window cleaners, but the big difference between them and other cleaners is they tend to only clean high rise windows. Who Should Hire Them- Landlords who own high rise buildings should hire a professional high rise window cleaning company. Landlords want to do what they can to keep their properties looking good, and this includes ensuring their windows are as clean as possible because it can enhance the appearance of the property. If you’re a landlord and you own a high rise building, then hire a professional. If you own a unit in a high rise building and you want to clean your windows, but you aren’t sure how to do a good job or you may not feel like it, then call a pro. They will be more than happy to clean your windows. Cleaning windows on a high rise building can be a challenge, which is why you should leave it to the professionals. Offices located in a high rise building can have their windows cleaned too. If you’re an office owner and your office is located inside a high rise building, then contact a professional. They will go to your property and clean your windows in a timely manner. Benefits Of High Rise Window Cleaners– They take care of the cleaning for you, which means you can focus on other things. Let’s face it, the chances are you’re very busy and don’t have time to clean your windows. If this sounds like you, then you should hire window cleaners who can clean high rise windows. Another benefit is they will do a great job because they are professionals and have the right equipment and products. If you were to do the job yourself, the chances are your windows will not be as clean as possible. If you want your windows thoroughly cleaned, then your best bet is to hire a professional. How To Hire A Good Window Cleaner– When it comes to finding good cleaners, you want to find one that has plenty of experience working with high rise buildings. There’s a big difference between a company that cleans windows of one or two-story homes and a professional that cleans windows on a high rise. Not only will they have plenty of experience, but choose a company that uses quality products because you don’t want cheap products used on your windows. Also, compare a few window cleaners and read a few reviews about each one and ask them to provide you with a quote. A good company can give you an estimate on what you can expect to pay. If a company doesn’t provide quotes, then consider using another one. The more companies you compare, the better off you’ll be. So what are you waiting for? – contact us for a Free, no obligation quotation on Window Cleaning Perth – ( www.cccwindowcleaning.com.au ).